Shipyards condominiums in downtown Jacksonville, Florida. SHIPYARDS is one of the largest mixed-use riverfront developments in Florida and is Jacksonville's only urban master-planned community with river views and marina. 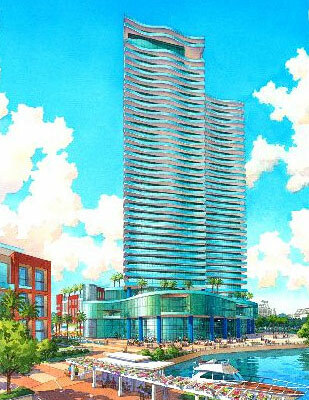 SHIPYARDS will feature sleek high-rise towers situated among the banks of the St. Johns River offering magnificent city and river views. SHIPYARDS has been planned as a community where all residents share a vast array of amenities typically found only in suburban locations. From beautifully manicured entrances, grounds, parks and gathering areas, to expansive recreation facilities including pools, spa, clubhouse, fitness center and marina. SHIPYARDS is located on approximately 40 acres of riverfront in the heart of Jacksonville's sports and entertainment district. The community is a short walk from EverBank stadium, the Baseball Grounds of Jacksonville, Veterans Memorial Arena and Metropolitan park. This prime location also puts residents just minutes from a number of major downtown employment centers, corporations and businesses, the new Jacksonville Public Library, art galleries, museums, dining, shopping, theaters and numerous performing arts venues. River taxi service also is planned to link SHIPYARDS to destinations on all of downtown, connecting residents to destinations on all along the St. Johns River. The community's first phase is planned to include multiple mixed-use towers located on the parcel of land west of Hogan's Creek. The first tower at SHIPYARDS, 800 Bay Street, will be a 38-story, 334-unit residential glass tower of one-, two- and three-bedroom residences. Prices from the high-$200's to more than $2 million, there is a wide array of product offerings with something for everyone. One-bedroom residences range from approximately 750 square feet to just over 1,100 square feet, two-bedroom residences are sized from 1,133 square feet to 1,476 square feet, while the three-bedroom homes start at 1,826 square feet and go up to 3,937 square feet in the penthouses. Don't miss the opportunity to live, work and play in downtown Jacksonville. SHIPYARDS is currently taking reservations and expects to go to contract later this year. Now is the time to get involved while preliminary pricing is still available and special 'InnerCircle' opportunities exist through the developer. Call or email me your name, address and phone number to find out more about this exciting opportunity!